Even if it feels as though the world is getting worse in many ways, it’s really important to remember that what we see on the news isn’t the whole story. Everywhere in the world, things are improving, progress is being made in a million different ways – and nowhere more so than in the world of technology. Our phones and tablets, often the subject of so much denigration in social commentary, have become gateways to new, better ways of living and connecting meaningfully with one another and all the cultures the world has to offer. They can also offer us innovative and simple ways to plan and organise our trips, manage budgets, save money, stay safe and record our precious adventures and memories for posterity. Here are ten of the best apps we’ve found which will be shaking up the world of travel in 2017 – we hope you find them useful! Designed as a sort of non-dating Tinder for solo female travellers, Tourlina has developed a firm fanbase due to its simple but ingenious idea paired with an easy-to-use interface. In a format that will be familiar to those who have used dating apps, you enter your interests and travel plans, and potential companions are offered up between whom you can swipe left or right. Creators Michael and Sandra came up with the idea in early 2015 after meeting many female solo travellers in SE Asia who were looking for travel buddies; whilst solo travel can be incredibly rewarding and life-affirming for women, there are many who still don’t feel comfortable travelling alone and even more who would like a companion for one leg of a journey, or even just an evening. 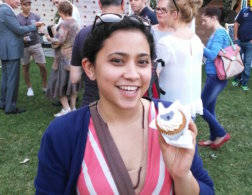 Tourlina makes it easy to meet up with like-minded women nearby in a safe and secure environment. I recently recommended it to a friend who is travelling to India alone after her planned travel companion cancelled at the last minute, and she has already found several potential new buddies to replace her for various parts of the journey. It’s free to download on iTunes here, although you’ll need to pay a small monthly fee to use the chat feature. Okay – now this one has the potential to be a real game-changer, especially for those who find their ability is travel is hampered by a lack of funds. 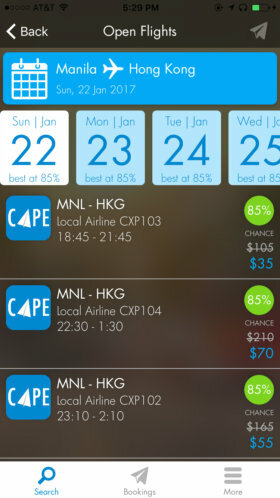 Cape, launched by a start-up based in the Philippines, is a brand new app which will enable ordinary last-minute travellers to sign up for standby tickets, which are unsold airline seats normally reserved only for airline employees, their relatives, or travellers who have missed an earlier flight. These tickets come at a staggering discount of around 70+% off the normal airfare, potentially revolutionising air travel and opening it up to an economic class of people who have never had the privilege before. It was initially developed by CEO and co-founder Lyle Jover, who had relatives in the airline industry and was able to take advantage of standby tickets – but was frustrated when his potential travel buddies couldn’t do the same due to the prohibitive cost of many airfares. The app works by allowing you to sign up to a waiting list for standby tickets, giving you real-time updates on your odds of boarding the flight, and only charging your credit card when the flight is 100% confirmed. 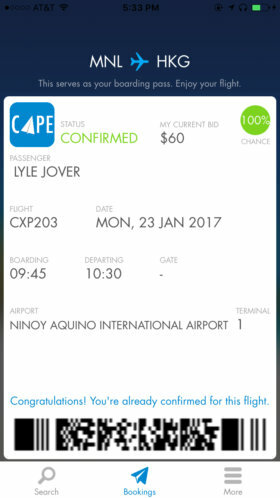 There is a social element too – users are notified when one of their friends books a flight through the app, then if the friend in turn books the same flight to join their companion, both of their tickets are further discounted. 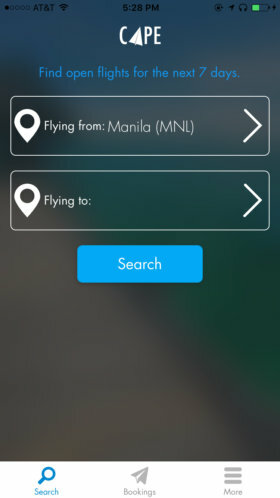 Although the developers have been working with airlines for a year in preparation, the app has only just been rolled out in the Philippines and Hong Kong to a handful of users, and it’ll be officially launched next month in March – we’re really excited to see how it’s going to change the face of travel. You can sign up to the waiting list here. A brand new app version of the popular website The Culture Trip, this little gem helps you find out everything cultural about the area you’re in or want to visit. 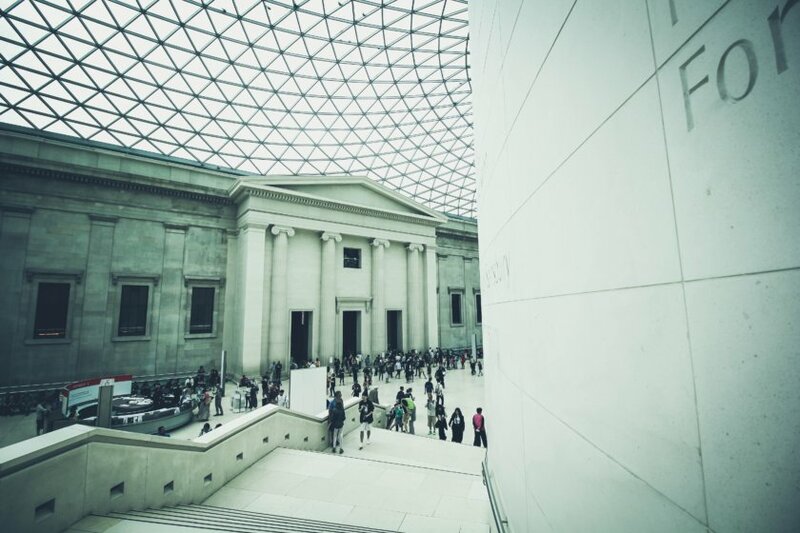 You choose what you want from a selection of different categories – the arts (including books, fine art, film & music), travel, history, design and food – and then enter your chosen location, and your feed fills up with interesting articles to peruse. For example, enter “food” and “travel” and then the location “Cambodia”, and you’ll get a feed full of articles such as “Top 5 Things to Do And See in Phnom Penh” or “A Brief Guide to Fish Amok, the Classic Cambodian Dish”. It’s the perfect app for finding everything out about the culture of the place you’re hoping to visit, learning about historical events, music to listen to, customs to follow, dishes to sample or hidden gems to visit. It’s a little bit like having a searchable guide book where you can just pull up the info you require at will, without having to thumb through pages or check the index. You can browse non-specific locations (such as “Asia”) to get inspiration for where to go on your next trip, or even just use it to discover things you didn’t know about the place you already live! There are 15 dedicated “city-hubs” (San Francisco, LA, Chicago, NYC, Houston, Toronto, Shanghai, Mumbai, Melbourne, Tel Aviv, Brussels, Paris, Barcelona, Berlin, London) for which new hyper-local articles are published every day – but all other locations across the globe are covered amply as well. 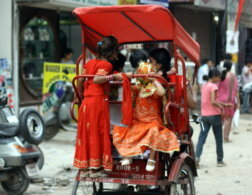 The interface is incredibly simple and easy to use and the quality of Culture Trip’s articles is guaranteed. You can download it on Google Play or iTunes, completely free of charge. Requirements: Android 4.1 and up; iOS 9 or later, compatible with iPhone, iPod touch or iPad. Travelling can bring out a variety of emotions; anxiety when you arrive just minutes before a flight, loneliness that can come with the first solo trip, exuberant joy at seeing that amazing sight you have always dreamed of. Being on the road is anything but bland and while we all love the craziness that comes with travel, it can also take a lot out of you physically and mentally. With little sleep, different time zones and less exercise it’s good to take at least 5 minutes each day to find peace of mind. That’s where Stop, Breathe & Think comes into play. The app helps you to check how you are feeling and where you thoughts are drifting. With that info, it provides guided meditations, yoga, and acupressure videos according to your mood. All in all over 50 meditations and emotion-based activities are available, and you can also collect fun stickers along the way based on your meditation progress. While there isn’t a sticker for “Meditated in front of a waterfall” yet, you can at least find peace anytime, anywhere with the app – waterfall or no waterfall. Learn more and download the app via the App Store or Google Play. The perfect app for those who want to record their adventures to either share with friends and family back home or for posterity, FindPenguins lets you create a blog as you travel on your mobile device, whilst also acting as a social network for travellers – who can follow and comment on fellow users’ posts. 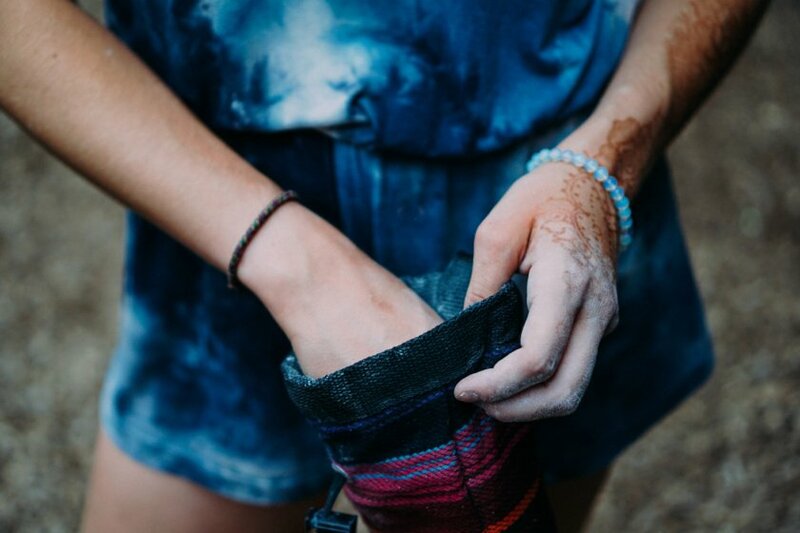 You create a personal travel profile, and then check in to record your experiences at various locations with photos and text; these individual entries are called “footprints”. You can create a footprint even when you’re offline, so the fact that you’re in an underground cave in Turkey or in the heart of the Gobi desert need not be a hindrance to creating your travel archive. Maps and photo albums are integrated into the app, and you can even create a book out of your footprints with just a few clicks. Founder Tobias Riedle was inspired to create the app to make travel blogging accessible to anyone going on a trip – be it two days or two weeks – not just those who are planning months away. Creating a blog the traditional way can be time-consuming and work-intensive, but with FindPenguins you can capture all your experiences quickly and easily with just a few clicks and swipes. You can download it on Google Play or iTunes for free, and there are only costs if you decide to print a book. 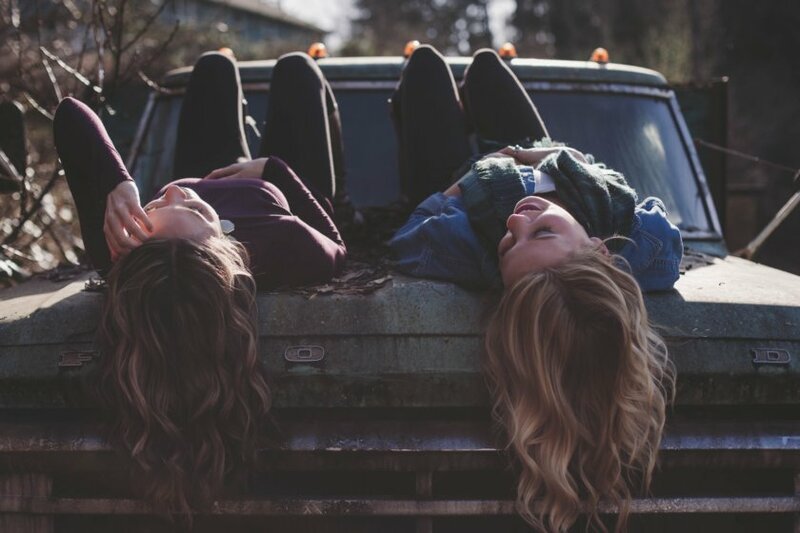 In a similar vein to Tourlina, Bungee Girl is another app aimed at connecting female solo travellers, but with a more specific aim – to visit each other’s city or town. 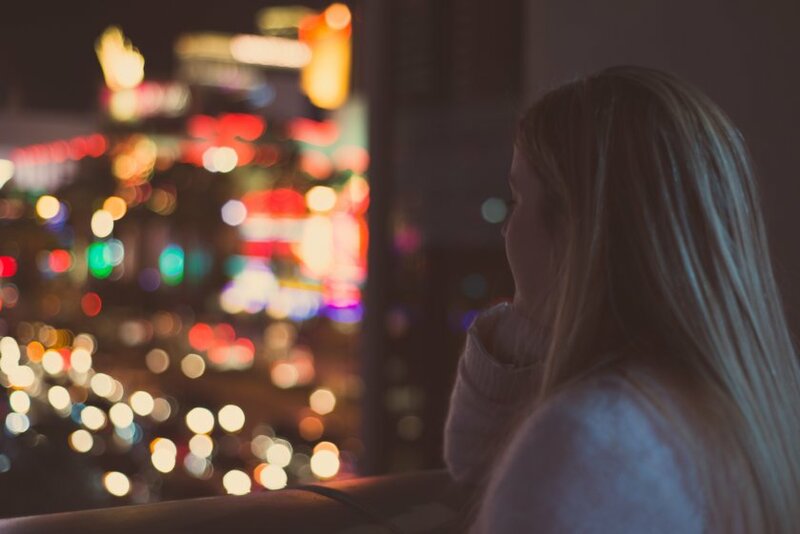 The idea is to connect women with a local counterpart in their city of choice, so that each girl can visit their chosen city with a local connection that is mutually beneficial. It’s great for women who want to visit a city armed with a little insider knowledge from someone who knows the place well, and through the app users can potentially find a wealth of valuable information – fun things to do, how to save cash, hidden gems that other tourists might miss, how to stay safe and avoid problem areas or local scams – and even someone to stay or hang out with on their trip. Users can also connect with potential travel buddies in their own city, and can create a “travel identity” which will help them connect with the most like-minded candidates. It’s currently only operational in a handful of major cities – Sydney, London, Paris, Copenhagen, San Francisco and New York – but the plan is to roll it out to new cities based on demand and user feedback. You can download it on iTunes here for free. Remember the days of travel agents? When you just told a neat, smiling rep sat behind a desk what you wanted to do and they’d just sort it all out for you? No, neither do I, because I’m a millennial – but I think to many of us who came of age in the era of online booking, this still sounds like a really attractive idea. Whilst part of the fun of planning a trip can be in sifting through all the best deals and planning out all the little details, not everyone enjoys this – sometimes you just don’t have time to do it, you may lack the know-how needed, or you might just be the kind of person who loses patience and enthusiasm for the laborious, time-consuming work involved. The beauty of Lola Travel is that you speak to a person – not Siri, not Ok Google, but a real live human being who is experienced in travel booking and to whom you can fully articulate complex wishes and requirements. It’s also perfect for those situations where life throws a curveball and you have to postpone, re-schedule or re-jig existing plans; simply text your new circumstances to your dedicated travel concierge, and they’ll find you a solution and have everything re-booked within minutes. It’s free to join, to download the app and to book hotels, but some agent service fees may apply for other types of travel, including (for example) a $25 agent service fee for flight bookings. When you’re in a new country, busy adjusting to the culture, climate and language, it can often be really easy to let money slip away almost without knowing where it’s gone. Foreign currencies, pricing and economies can further complicate matters and before you know it, your wallet can end up dangerously empty. TrabeePocket is a travel expense tracker that enables you to keep a close eye on exactly what you’re spending; you simply enter in your budget, log the money you have spent, and it will calculate what you have left and exactly what everything has cost in your home country’s currency. This makes it much easier to get to grips with new exchange rates without constantly having to do mental arithmetic, meaning it’s easier to spot when you’re being fleeced, when you’re onto a bargain, or when you’re simply spending too much. The app will even give you a report on your expenses at the end of your trip, so you can analyse your spending habits and budget better next time. It’s free to download, but you can upgrade to the Pro version for $1.99 – you can find it on both iTunes and Google Play. 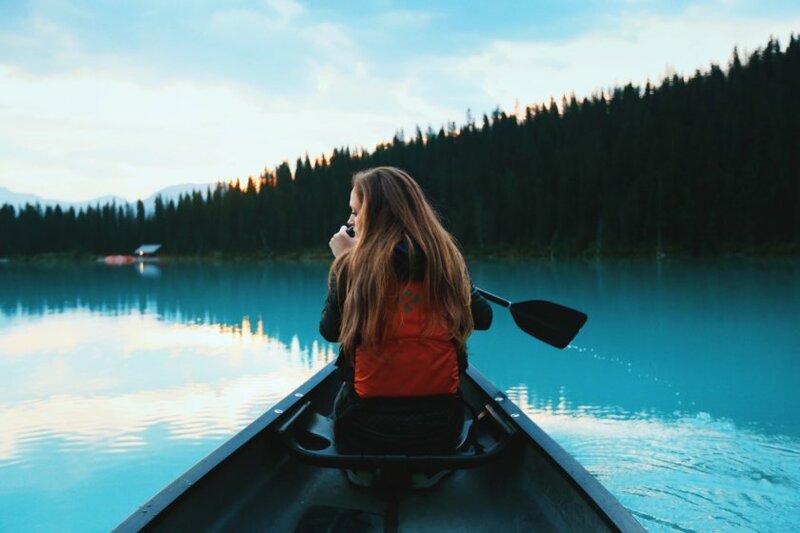 Safety whilst travelling solo is a particular concern for female travellers, and it’s often cited as a reason why women avoid taking trips on their own. 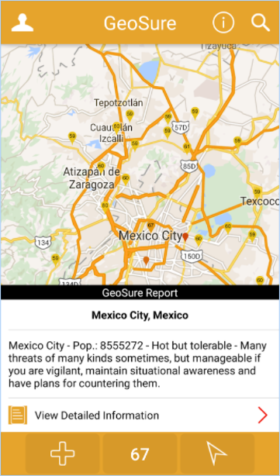 Luckily technology is helping to solve many problems in this area, and GeoSure is a great resource for any traveller who wants to stay safe not by hiding away in a hotel room, but by being informed. 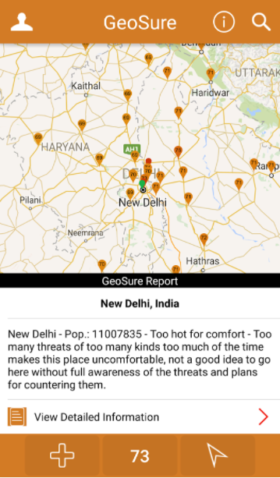 Data on thousands of cities and neighbourhoods is crowdsourced and collated giving travellers an accurate picture of the risks and potential pitfalls of any area, with an overall safety “temperature” rating given in the form of a score out of 100, plus a colour of either green (cool – go ahead), amber (warm – exercise caution) or red (hot – stay away). Users can share their experiences, good and bad, so that other visitors have a good idea of what to expect, and the app features real-time reports from its global community and live information sources (such as the UN, CDC, WHO, State Department, Interpol and local authorities) to keep you up to date on the latest events and environmental conditions at your chosen destination. 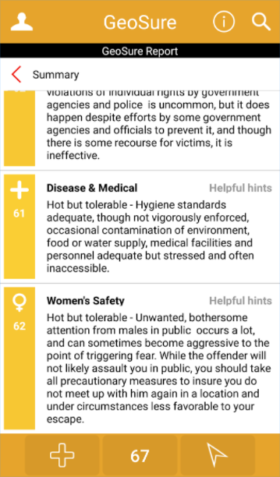 The app also has a whole category dedicated to female safety, making it a must for any travelette who wants to be street-smart without having to learn things the hard way. It’s available to download on iTunes and Google Play – and it won’t cost you a penny. 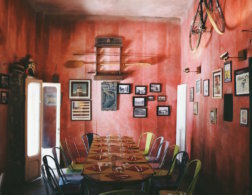 Ever wanted to get a feel for a place before you visit it, but find that image searches and scrolling through TripAdvisor reviews leaves you with even less of an idea of what to expect? 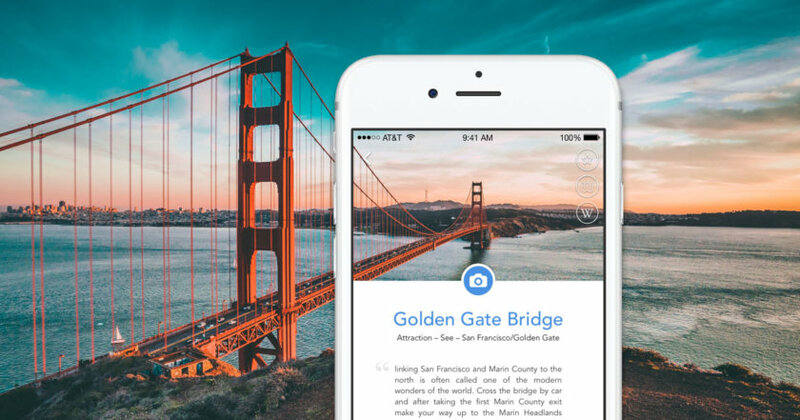 Modern Atlas is the app you’re looking for. Founder/creator Eric Wolfe says “the goal of Modern Atlas is to both mimic and augment the feeling of wandering around a new city and stumbling on a special spot,” and users can do this by browsing or searching the map for a location, then zooming, pinching, panning and tapping on various landmarks, so that photographs and informative text pop up. 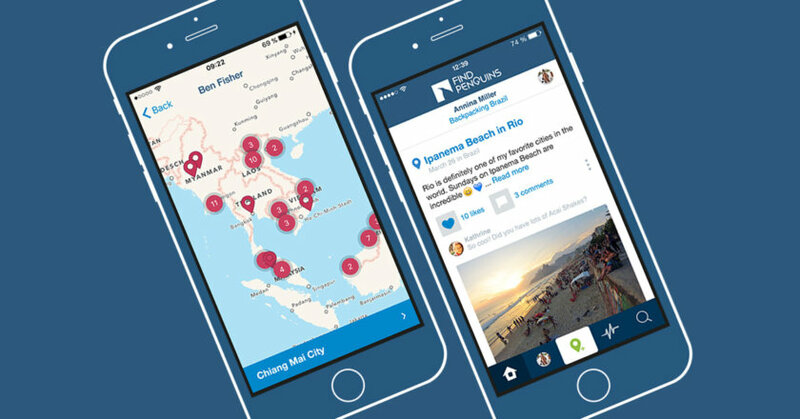 The app features pictures taken by other travellers and is connected to both Wikipedia and its sister site, Wikivoyage, so that a vast amount of visual and factual information is at your fingertips – to be precise, 1.5 million different sites with information collated from 21,000 different travel guides. You can filter the locations that show up on the map if you are looking for something specific, such as hotels, bars, restaurants or historic spots, and then bookmark places you want to visit to create your own individual “travel guide” map to follow when you actually visit the location. For example, I might create a map called “bar hopping in Rome” filled with all the places that I’ve found and researched through the app, which I can then easily see and plan the best route through. You can basically plan out entire days of your trip this way, finding hidden spots and unexpected gems as you go – and if you don’t have the time or funds for a trip at any given moment, it’s a wonderful way to “explore” the world visually from your armchair and get inspiration for your next voyage! Modern Atlas can be downloaded at iTunes for the princely sum of $0.99. Are there any apps you’ve found invaluable for travel and would like to share with other travellers? Let us know in the comments! *This post was created in collaboration with some of the featured apps. I personally love Tourlina! Haven't heard of quite a few of these, excited to give the new ones a try too! Thanks for these... great apps to add to my phone or our upcoming adventures! 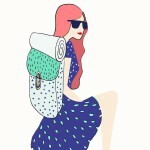 Thanks for this roundup of travel apps. Some I'd not even heard of, despite the fact that my phone is full of travel apps. 2017 looks to be a banner year for apps to make our lives safer, more comfortable and more fun on the road. Gotta love that! I needed these! I've been looking for an app like modern atlas and I'm glad I know something like it actually exists! Cape looks like it could be super interesting, thanks for giving us an early look! I have never used these apps before but I should start with it. Wow........Thank you for sharing some awesome apps that I would have never known existed!!! I'm so excited to try some of these and share them on my blog. Your a Rock Star!!!!! Many lists are just a re-hash of many of the apps I've already tried or am currently using. I like this list because I had never heard of any of these apps previously. thanks Lee, I did work extra hard to dig out new apps rather than just list the usual suspects so it's nice to get some appreciation for that! Thanks for the info. I personally love Tripit app. It keeps all my travel arrangements in one app. Flights, hotels, rental car info. Very easy to use. Happy traveling. Love Modern Altlas. Will try the other apps!